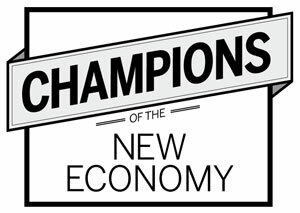 In an effort to recognize business leaders and individuals who are moving southeast Michigan’s economy forward, we present the Champions of the New Economy. Developed by Junior Achievement of Southeastern Michigan, which operates the Rock Financial J.A. Finance Park in downtown Detroit, the program was created in partnership with DBusiness magazine and News/Talk 760 WJR. Please join us on the following pages as we honor five Champions of the New Economy. We also invite you to a special ceremony honoring the champions at the Rock Financial J.A. Finance Park on Thursday, May 13, from 6 p.m. to 9 p.m.
Mark Shobe, a 28-year veteran of the financial services industry, joined a run-of-the-mill credit union a decade ago; today it’s Michigan’s largest. More growth is on the horizon. Shobe also has improved customer relations and programs, and his employees are offered a bonus if the credit union exceeds its goals for the year. What was running through your mind when the global financial crisis hit in September 2008? First was the shotgun marriage of Merrill Lynch with Bank of America. Then, despite a steadily falling stock price, Lehman’s bankruptcy filing was a surprise — [although] it did enlighten the industry to the severity of their problems. What we didn’t fully realize immediately was that this was just the tip of the iceberg. Most people underestimated the impact on the availability of credit and the house of cards [that came] down thereafter. Most community institutions like us avoided subprime lending and didn’t have house-trading accounts like the multinational banks. We make a living knowing our customer, and only make loans that we actually want to be repaid. So our interests are aligned with the customer. We didn’t really feel the effects until the precipitous decline in real estate values and the spike in unemployment. How did you reassure customers at the time that their savings were safe? Beyond the deposit insurance guarantee, we could demonstrate DFCU’s strong financial condition — not only by our words, but also by our actions. For example, we continued to lend and make large charitable donations to the local community. DFCU Financial also continued its large annual special patronage dividend, totaling $19 million [in 2009] and $71 million over the last four years. This represents monies returned directly to our customers for doing business with DFCU Financial, much of which is cycled back into the Michigan economy. The credit union has experienced record growth since you took over, and yet you haven’t wavered from your core mission of servicing individual customers. Are you ever tempted to tap into other markets? We’re not considering entering any new lines of business. Rather, [we’re focused on] aggressively pursuing geographic market expansion. Where do you see growth coming from? Taking our value proposition to new geographic markets. There’s a large opportunity in investment advisory services for middle-income consumers. This market segment tends to be underserved by the large investment firms. How do you keep a staff of 550 employees focused and on message? Given our singular focus on the individual consumer, there’s no confusion as to our focus and brand. Also, we go to great lengths to make sure everyone feels they’re part of our success. I make it a point to attend department meetings to stay connected, answer questions, and learn firsthand the issues our employees are encountering. If President Obama called and asked for advice on turning around the country’s economy, what would you say? While the U.S. has many needs, just like a business, those needs require prioritization and focus to deliver expedient results that have an impact. Therefore, my recommendation would be to focus on where the majority of new jobs are created — small business. The objective should be to make the environment as attractive as possible, to encourage small-business investment and growth. Other political agenda items are distracting the country’s attention from the most important need: job creation. What’s been the highlight of your tenure at DFCU Financial, and the biggest disappointment? The highlight has been taking an “also ran” institution and turning it into an industry leader. My greatest disappointment has been witnessing, up close, the heartbreaking impact the economic collapse has had on so many people who have lost their jobs and homes. Detroit Mayor Dave Bing is doing a great job, but no one knows who the state’s next governor will be. What do you see for the future of Detroit and Michigan? I am optimistic, given our strengths in the quality of our higher educational institutions, our skilled workforce, our well-established business expertise in multiple industries, and Michigan’s wonderful natural resources. Increasing Michigan’s competitiveness will necessitate government being more business-friendly, and our workforce needs to continue its transformation toward globally competitive compensation and benefit levels. Mayor Bing is an excellent example of business acumen being applied to the public sector. Glenn Oliver, a lawyer and former member of the Detroit Board of Water Commissioners, launched a B2B Web site that acts as a clearinghouse for water infrastructure projects around the world. The online marketplace, which draws 15,000 visitors per month, allows vendors to bid on water and wastewater projects, mostly from utilities and municipalities. Oliver operates several related Web sites, including www.h2bidfinance.com, which helps contractors identify funding sources. Looking back at the goals for your business when it opened in 2006, are you satisfied today that it’s ‘mission accomplished’? Yes, I am satisfied that we are helping to bring down the cost of delivering water and wastewater services to the world’s homes and businesses. We are in the right place at the right time as two important issues converge. One, municipalities have a strong need to reduce costs in their water systems. We impact this aspect by using technology to reach a wider pool of vendors. More vendors bidding means municipalities get a better price because of increased competition. Secondly, water is becoming the issue of the 21st century. The service allows for greater efficiency and transparency in the efforts to address our growing needs around providing water. What’s been your biggest challenge over the last four years? Finding new ways of informing people about our service. H2bid makes it easier for water utilities and vendors to do business with each other. Through a few simple keystrokes, a water utility can potentially save millions of dollars by using H2bid. Similarly, vendors can easily find contracts that they cannot find anywhere else. What advice can you provide for tapping into new markets? Overcome the language barrier by making your services easier for people to read in their native language. Be persistent in your drive to establish yourself in a new market. Be flexible and open to change. Sometimes it takes a while for people to adopt a new way of doing things, even when it’s more efficient and saves money. The Great Lakes contain 20 percent of the world’s fresh water supply. What future challenges do Michigan and the rest of the Great Lakes states face as an ever-increasing global population zeroes in on that water? The first challenge to overcome is the fear of diminishing resources. People are working feverishly to implement new technologies and approaches to providing water-delivery systems. A lot of people on the coasts are planning massive investments in desalination plants. Conservation and recycling will also provide relief in those areas. This is why I think concerns about dwindling water supplies might be somewhat overstated. Even so, I believe [that] at some point we’ll see more people and businesses relocating to the Great Lake states to be near an abundant supply of fresh water. Are there added protections that should be in place to preserve the Great Lakes? Maybe, but doing so will be difficult because people living around the Great Lakes will resist sharing more of their natural resource out of fear that they will lose something important. Water is necessary for life — everyone understands this, even if only on an instinctual level. The fact is we have enough water to sustain our population. The question and the challenge is: How do we deliver water to everyone in a fair, efficient, and equitable manner? Still, if the federal government decided to divert Great Lakes water to other areas, it would be hard to stop that from happening. What are the growth sectors in providing water to the masses? First, it’s infrastructure, products, and services. Developed countries have crumbling infrastructures, and developing nations need new infrastructures. Second, desalination technology. There’s a lot of water in the ocean, and the people on the coasts are going to be drinking it. New technologies are needed to bring down the costs of desalination and reduce the environmental impact. Fortunately, H2bid is connecting water utilities and vendors in both sectors. And finally, [we need to find] new cost-efficient and sustainable ways of addressing the water needs of 7 billion people in a global market. Brent Yax started his Web design, consulting, and hosting company in 1999, weathered the dot-com bust in 2001, and has since posted double-digit annual revenue growth. His latest innovation is to offer a pay-for-lead model, where clients are charged only for new traffic Awecomm generates on a given Web site. How do Detroit’s and Michigan’s tech communities stack up against the rest of the nation’s — and how would you spur even more employment, research, and activity? The tech community in Michigan is definitely competitive with other tech cities across the U.S. Unfortunately, I don’t think southeastern Michigan has nearly the draw for talent as these other areas do. We’ve been fortunate to find some talented people to add to our team, but it can sometimes be a challenge to fill multiple positions, especially when you’re looking for someone with a number of years’ experience in a very specialized niche. I would hope that Michigan understands it will take a large commitment over time to create good jobs that attract these talented individuals. We should be planning now for the environment we want to see in 10 or 15 years. If that means tax breaks now for companies moving into the state, or expanding into the state, then we must be intelligent and patient enough to realize that this will help us in the future in the form of new jobs, more spending in local businesses, and eventually new tax dollars from our new Michigan companies. What are some of the structural challenges in Michigan that are impeding job attraction and retention efforts, and what advice would you offer to government leaders to boost employment across multiple business sectors? The most important challenges facing Michigan right now are perceptual. It’s very hard to attract people to a region that has so much negative publicity — some not warranted, I’ll agree, but some is completely justified. We’ve had years of controversy and corruption surrounding the governing body of Detroit, we have two major cities ranked in the top three of the most dangerous cities, we’ve been ranked as one of the unhealthiest cities, and are repeatedly voted one of the worst cities in America. I traveled to a number of major cities while I was a consultant, and I can honestly say I love Michigan and I know we have some great things going for us, but not many people outside of our region share the same view. If the state wants to increase job attraction and retention, they must do something to clean up southeastern Michigan’s reputation. I would like to see more programs and more funding for revitalizing decaying areas and more funding that allows cities to dramatically reduce major crimes. If Steve Jobs called and asked you to design an app for the iPhone, what would it be? That’s a funny question. I’ve had an iPhone for a while now and, unfortunately, my answer would have to be an application that allows me to use my phone on other carriers’ networks. Fortunately, I doubt Steve Jobs would be calling me. What’s the next revolution in social media, or have we already hit nirvana with Facebook, Twitter, LinkedIn, and MySpace? We’ll continue to see a strong push for better communication — for example, integrating webcams and voice-chatting services within existing social frameworks. I also think we’ll see a merging of the business and personal sides of the industry. Currently, allowing someone to maintain a single profile with multiple contact lists, and then allowing the control of how that profile is shared to each of those lists, is something that’s lacking across all of the major social platforms. The company that can roll out a solution that increases the effectiveness of communication, while also offering a secure combination of business and personal contacts, could give the current leaders a run for their money. W Industries, a manufacturing supplier, was almost exclusively automotive since its founding in 1981. But over the last several years, Ed Walker, a second-generation business owner, has diversified the client base to include components and systems for aerospace, defense, homeland security, alternative energy, and heavy equipment. Over the last five years, annual revenue has grown 30 percent, on average. Revenue in 2009 was $150 million. When fulfilling contracts for companies around the country, is being from Detroit a negative thing? Do you have to stick up for Detroit at times? No. Our work speaks for itself. We’re a proud partner of the city of Detroit and the state of Michigan. What business executive do you admire the most, and why? Warren Buffett. His morals and reputation — and most of all, how he’s been able to read the markets and remain flexible. What do you say to a client when an expensive, highly specialized order can’t be met because it’s physically impossible? Is it back to the drawing board? W Industries believes in providing its clients with all of the necessary information to make a well-informed decision. Our goal is to create a win-win situation for all parties. You were heavily into servicing the automotive industry, but in 2002 you began to diversify into other sectors such as defense. What advice would you offer to other businesses looking to diversify? Determine your core strengths and align your business model to fit your strengths. Now that you’re diversified, how do you keep everyone focused on providing superior quality while still meeting deadlines? W Industries’ focus is quality over quantity, and customer service is paramount. Where do you see growth coming in your industry? Diversification with alternative energy, homeland security, and shipbuilding. What’s more frustrating — losing out to a competitor or picking up the pieces when a rival undercuts everyone on price and can’t fulfill the contract? Picking up the pieces when a rival undercuts everyone on price and can’t fulfill the contract. Where do you look for advice on business challenges? W’s management team, local business leaders, and national leaders such as Warren Buffett, Donald Trump, and T. Boone Pickens. With new foundation investment and continued support from Wayne State University, Randal Charlton and his TechTown team are assisting more than 180 companies and 1,250 entrepreneurs with growth strategies. The 12-block TechTown, located at the north end of Wayne State’s campus, is the state’s premier nonprofit research and technology park. Over the next 50 years, the world’s global power-generation system will need to be completely rebuilt and expanded. What role will TechTown play in the transformation? TechTown is already home to a number of companies that are focused on alternatives to fossil fuel. Next Energy has played a leading role in accessing federal funds to drive research and development in Michigan. I hope to see that role grow, and to contribute to Michigan becoming a recognized world leader in alternative energy. From your recent trip to Israel, how does a small nation become such a cutting-edge innovator in life sciences? We can learn a great deal from the Israeli experiment. It’s a tiny country, the size of New Jersey, with virtually no natural resources and surrounded by declared enemies. However, they have a massive research budget and are committed to taking that research into the marketplace as quickly as possible, often through business incubators. Their business incubators were established by the government in the 1990s and were initially unsuccessful. However, instead of closing them down, the Israelis privatized them and poured more money into supporting emerging life sciences and other technology companies housed in incubators. The combination of private incubator management with greater access to early-stage capital for emerging companies is proving a powerful formula for success. The government support for early-stage life-science commercialization has, in turn, helped to attract a massive amount of private venture capital. The Israelis also understand the power of teamwork. What was it like to dine with the king of Saudi Arabia, and what business lessons did you take away from the experience? I enjoyed an hour or two of pure fantasy. I imagined I was following in the footsteps of Lawrence of Arabia. I sat next to the king’s doctor, who had the duty of tasting the king’s food to make sure it was not poisoned. I was operating a small company at the time, focused on helping to grow food in the searing heat of the arid Saudi desert. The big lesson I learned is that small companies can play on a big stage if they address challenging issues of national importance. Now that Michigan voters have passed a ballot initiative to open up stem-cell research, is the state realizing the industry’s full potential? No, but then nobody else is [either]. I think Michigan’s top stem researchers will tell you that the industry is still in its early stages, and much work remains to be done to turn laboratory research into cures that can be put in the hands of doctors and surgeons. The ballot initiative does level the playing field, though. What will be the promising outcomes of the 2010 World Stem Cell Summit being held in Detroit in October? A major outcome will be the recognition around the world that there is a lot more to Motown than an auto industry. We have three leading research universities in southeast Michigan, which between them, carry out something like $1.3 billion of research a year, much of it in life sciences. I expect some international partnerships to develop between foreign researchers and the Michigan life-science community.